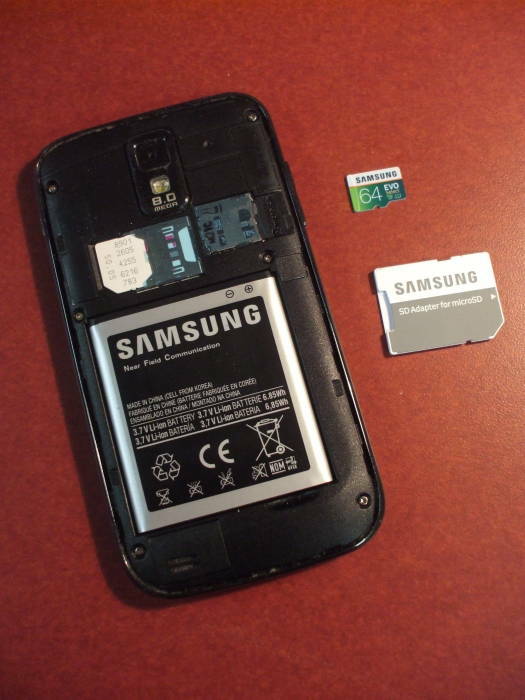 We want to install a larger flash memory chip in an Android smart phone. We need to make sure that all of the data has been transferred. This must include all of our personal data — pictures, music, and other media — plus the data structures used by our apps. The tar utility in Linux makes this easy. I originally added a 16 GB memory chip in the phone. 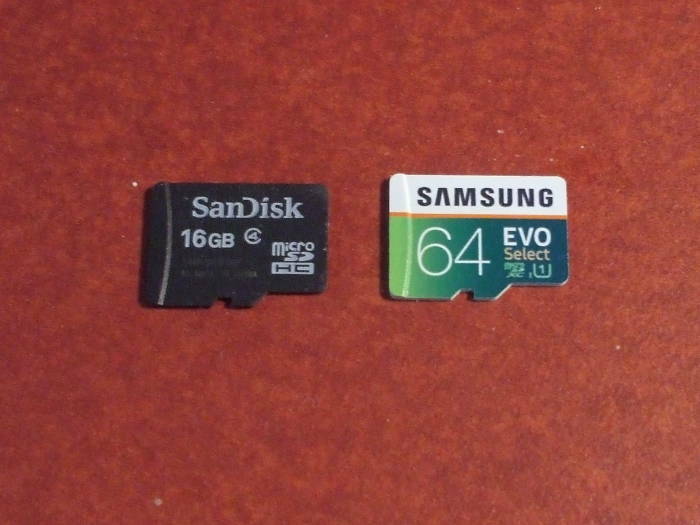 Now I wanted to upgrade to 64 GB. 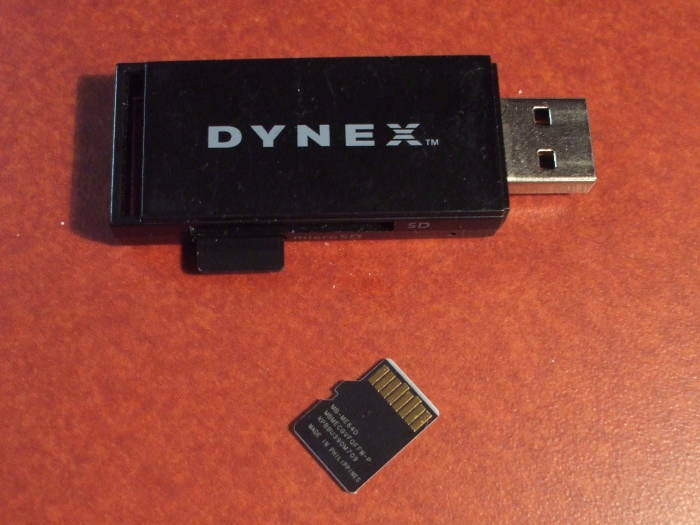 Plug the memory chip into a reader, and then plug the reader into a USB port on your computer. Below is what we find in the kernel ring buffer on Linux. I have several fixed disks in this system, sda through sdf, so this new device becomes sdg. [40737.576590] FAT-fs (sdg1): Volume was not properly unmounted. Some data may be corrupt. Please run fsck. I could have done this on OpenBSD. The only difference is that the device names are different. Let's say it's on my laptop, which has just one fixed disk, sd0. The new USB device would be sd1, and /dev/sd1i would be the relevant slice and device name to use in the following. Back on my Linux desktop, the KDE graphical environment has mounted the new device under /run/media. The automatically generated mount point within that is the user name and then the volume ID of the file system. I change to the newly mounted file system to see what's there. drwx------  9 cromwell cromwell  32K Dec 31  1969 .
drwxr-x---+ 3 root     root       60 Apr  8 21:24 ..
Now I make an archive in my home directory. The archive is of the current directory, ". ", and therefore all the contents of this file system. If you simply copy or archive the contents while referring to them as "*", that will not match those with names starting with "." such as .android_secure in this example. $ tar cf ~/phone.tar . Now swap the memory chips. The new one may have an exFAT file system. The FAT32 file system cannot have files larger than 4 GB. Note that FAT32 or exFAT is the file system, thus the total volume size, number of files, and maximum file size. VFAT has to do with supporting long file names. If a file system is FAT32 it probably includes the VFAT extension, but VFAT might be used with FAT12 or FAT16. You will need the exFAT tools to support exFAT. On Linux the packages are probably exfat-utils and fuse-exfat, on OpenBSD it is the single package exfat-fuse. With those tools in place, the system can mount the device. The new mount point will be an essentially random file system volume ID. Now I can extract the archive into the empty file system on the new memory chip. Almost 60 GB of free space for pictures and other media!